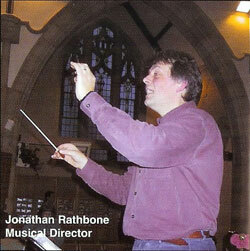 Jonathan Rathbone was a chorister at Coventry Cathedral and then a Choral Scholar at Christ's College, Cambridge, where he read mathematics. He then gained a second degree, this time in music at the Royal Academy of Music specialising in singing and composition, winning prizes for orchestration and choral conducting. Having sung with St Bride's Choir, Fleet Street, and the BBC Singers, he joined the Swingle Singers. He became their musical director and wrote the majority of the music they sang for over a decade. His arrangement of “Fool on the Hill” was nominated for a Grammy. He is now a composer, published exclusively by Peters Edition. Geoff Walker is our Associate Musical Director.